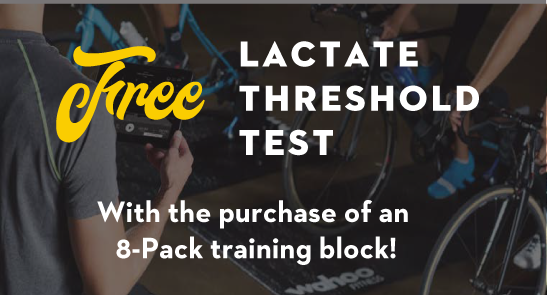 Get a free lactate threshold test when you buy an 8-Pack of training sessions! For a limited time, the Speed Shop will offer LT tests for free with the purchase of a training 8-Pack. These tests are conducted in the training center with our blood lactate test meter for the most accurate and useful data. Click below to get your 8-Pack and free LT test. An LT test is the most accurate way to measure fitness, track progress, and dial in your training with precision and efficiency. Click below to schedule sessions or purchase multi session packs. Use the scheduler to choose your training days and pick your station. Click below to reserve training sessions now! The Speed Shop Training Center at Mellow Johnny's features state-of-the-art indoor training with Wahoo trainers and an experienced, full-time coaching staff. Led by Brant Speed, an accomplished bike racer and coach with more than 15 years of experience, he can train athletes at all levels and disciplines. Each session is one hour of focused, quality riding, using metrics like heart rate, cadence, and power to track your progress and keep you honest. Whether you're training for the MS150, Leadville 100, Tour de France, or to just lose ten pounds, The Speed Shop builds specific programs to reach your goals. You and your coach. No distractions. All you. Open Gym ride: $15, No coach, no program. Just ride a Zwift workout or your own homemade session. We offer a comprehensive bike fit using Retul’s 3-D motion capture system. Each fitting includes a professional analysis of your cleat placement, saddle and handlebar position, pedaling style, and overall form on the bike. Our fit techs are trained in Morgan Hill California and Boulder Colorado, and are constantly tested to current standards of the craft. Want to know more about the Speed shop? Email us.